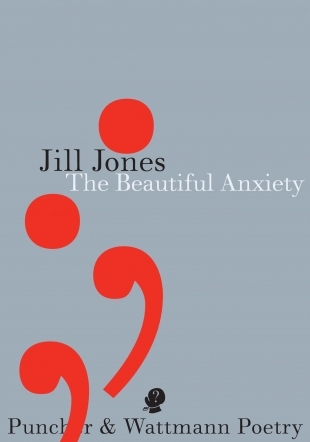 The Beautiful Anxiety by Jill Jones. Puncher & Watermann 2013. When or how can anxiety be beautiful? Consider the possibility of a trembling current within all things, like the flickerings of light and water; the pulse of language becoming elevated; an overload of images; the meshings of city temporalities; tinglings and scratches of affect; the moment’s anxious possibilities for birth, death and rebirth. Jill Jones’s latest collection reaches towards all of these, and is informed by them. The book opens with the sequence ‘My Ruined Lyrics’. The first poem is entitled ‘Hold On’, the second ‘I’m Coming’. This may well be a nod to the Sam and Dave soul classic ‘Hold On, I’m Comin’’, dividing the song’s title over two poem titles. There’s a hint of Dorothy Porter in the sparseness of ‘Hold On’ and ‘I’m Coming’, although Jones’s instinct is for subtlety and suppleness, as opposed to Porter’s tendency to go for the jugular. ‘I’m Coming’ also has undercurrents of the detective on the case (of love), one of Porter’s favourite motifs. Nevertheless, Porter and Jones are very different poets, and considering their respective oeuvres, I don’t think any particularly meaningful comparison can really be made. ‘Wave’, by its halfway point (at its crest?) is unmistakably recycling itself; it allures in the ways it permutes prior words, phrases, and images. But on a closer look the poem had been doing this from early on, beginning with recurrences of ‘the traffic’ and ‘the sky’. ‘The traffic begins its wave’ morphs into ‘the hours begin to waver’. The poem’s closing morph, ‘each ticket is beautiful within its own exhaust’ perhaps stretches the trick to breaking point (though perhaps this is fitting for the endpoint of a wave). It’s a delightful poem. ‘Some (…… ) Time’ includes ‘a fragment from a fragment of Sappho’. The parenthetic ‘gap’ in the title would seem to be a space left open by (or for) the future, since translations of the Sappho fragment in question (number 147) contain the phrase ‘some future time’. Jones renders the fragment as ‘some future time / will think / ?’. The latter part of fragment 147 might be translated as ‘someone in / some future time / will think of us’. So Jones has fragmented the fragment (as noted) and torqued it into a question—one which seems to allude to anxieties over current events and where they may be headed. Such questions hover over a number of poems in the collection, interwoven with the personal, the social, the environmental, the beautiful (not that these are discrete categories, of course). Futures and futurity reappear across the collection’s three sections, as suggested by poem titles such as ‘What’s Coming Next’, ‘The Future’, the aforementioned ‘Some (…… ) Time’, and ‘The Futures’. One way of thinking about anxiety is as a mental/affective projection of the future that intrudes upon one’s awareness of the present moment. To oversimplify Derrida (see, for example, his 1998 essay ‘As If It Were Possible, “Within Such Limits …”’), one might consider two kinds of future or futurity. On the one hand there is a future that is relatively predictable and calculable, as in the realms of weather forecasting, economic modelling, or seemingly straightforward inductive reasoning, like the idea that the sun will rise again tomorrow morning. Then on the other hand there is what Derrida calls l’avenir: the realm of the completely unforeseen, indeterminate, incalculable … or indeed, messianic. Does anxiety tap into this kind of incalculable future? Or does it always hinge upon a predicted possibility, rather than the unforeseen? I’m not entirely sure (and I’d resist having to decide under such binary terms), but the thematic futures recurring through The Beautiful Anxiety had me thinking along these paths. Here the indeterminacy is accentuated by form: unpunctuated lines, with linebreaks that seem playfully ambiguous. Should the reader flow on with enjambment, or jump-cut, e.g. from ‘smoky’ to ‘we travel’, or from the latter to ‘our uncertain seats’? Are the planets smoky, or are ‘we’ smoky, or both ‘we’ and the planets? Hence the stanza is infused with possibilities, where two seeming forks in a road might be followed at once, or alternated between. Stanzas such as this offer suggestiveness, polysemy, echoes, image-hauntings. Some of the more sparsely punctuated or unpunctuated poems made me reconsider the book’s cover. It almost seems some unneeded punctuation has been stripped from the poems and strayed onto the cover, which itself might be termed minimalist vispo (i.e. visual poetry) with its full stops and commas (or is that a colon, a semi-colon … ?) Anxiety might be seen figuratively as a scarcity of punctuation (like a shortness of breath), or for that matter an overload of punctuation. Damage seems almost a necessity. Then later in the poem, ‘You step out with your necessity / because nothing will grow within / houses for too long’. To me this suggests anxiety as avoidance, and a need to overcome this; though ‘You step out with your necessity’ has a hint of ridicule or deprecation about it. ‘Recoveries’ (p. 47), on the other hand, is practically devoid of articles, conjunctions and prepositions, which pushes it toward abstraction and a somewhat staccato rhythm. But it works as a fusion of images, and opens itself to the reader’s imaginative ‘recoveries’ of scene and sense. The ‘Wandering Breath’ section foregrounds the poem as process/procedure, or the ‘poem as exercise’. To my mind, the latter is in no way a pejorative description. The ‘Wandering Breath’ poems are not merely exercises for the poet, since they can be fascinating exercises for a reader too—for example, the aforementioned ‘Recoveries’ and ‘The air will tell us’, which is ‘patched’ (i.e. a patchwork of fragments) from Patrick White’s novel Voss. The Beautiful Anxiety is dedicated to Jones’s mother, who passed away in 2007, and in Part Three, themes of death and mourning come to the fore. The title of this final section (‘Which is being too’) seems to be shorthand for lines which appear in the poem ‘Sensate’: ‘all that outside / which is / being too’. ‘Big Flower’ relates a dream involving death, personified as a ‘night visitor’; yet the dreamer ‘did not even die but rose / through the strata, plains of clouds / beams, quivers, satellites, walkers / to the place the moon might be’. Then the closing stanza begins with ‘Death knows me, the moon knows / me’. And if we turn back a couple of pages, we’ll be reminded in the final line of ‘Erosions’ that ‘No dream stands outside of history’. ‘Urn’ performs what Kate Lilley refers to on the back cover as ‘the work of mourning’, beginning with the lines ‘I don’t know / where to put you’. Death figures as absence; and perhaps, for those still living, as the idea of an afterlife, the place of those passed: ‘Here is the Nothing. / It’s an old country / shaped by dreads and births.’ The poems ends with ‘This is one fight / you win by losing’ (whether this be the fight to hold on to life, or the struggle of mourning?). ‘Sometimes they put you in seas / or rivers without telling you.’: these are the opening lines from ‘The Slide’. Later on the poem offers what could be a description of anxiety: ‘It is chemical, archaeological / and violent’. Along with the title poem, for me this was perhaps the most ‘anxious’ poem in the collection: it has an insistence about it, and embodies a kind of dark vertigo. It’s also one of the most beautiful poems in the book. ‘In Air’ closes the collection, with its final line ‘there’s no reply that won’t hurt you’. Once again, this could be read as a manifestation of anxiety—anxiety as anticipation, as a projected, troubling future. Whereas the preceding lines of the poem tend towards consolation, or encouragement to dwell in a state of peace or acceptance alongside (or within) such anxiety: ‘Move slowly and compose in air’. Despite the recurring and interrelated themes I’ve mentioned (love, death, anxiety, the future), I don’t feel the collection is pushing for a unified theme or argument—or at least it’s not pushy in doing so. It is resolutely eclectic, heterogeneous, and yet close-knit. From my readings of The Beautiful Anxiety I noted the consistency of Jones’s attentiveness to affective and sensual registers, and to ‘all that outside / which is / being too’ (‘Sensate’). These qualities will be familiar to those who have read her earlier work, but they seem especially distilled in this collection. Not only is Jones capable of an attention-in-miniature, but also of flitting effortlessly between scales (by which I mean scales of proportion, of music, and of weight). So often she catches you unawares to extend and renew your awareness of what is. This entry was posted in Issue 11, Jill Jones, Puncher & Wattmann, Stu Hatton, The Beautiful Anxiety and tagged Australian Literature, Australian poetry, Dorothy Porter, Jill Jones, Puncher & Wattmann, Sam and Dave, Sappho, Stu Hatton by Mark Roberts. Bookmark the permalink. “…resolutely eclectic, heterogeneous, and yet close-knit.” Very well written – enjoyed this review – now must read the book.